This is my very first Handmade Monday post. 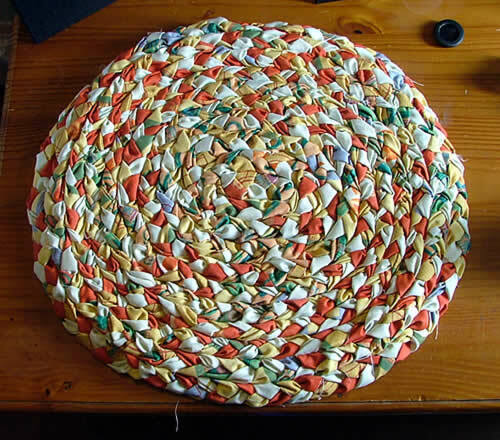 I have been busy making a rag rug this week. I had lots of left over scraps of fabric from other projects. I had also bought some remnants from ebay for a patchwork project I haven't got round to yet. I will be painting the floor in my craft room soon and I will need a nice rug to put on the down once it's done. I cut out lots of strips of fabric and plaited them to make a long strand of fabric. I then stitched the plaits together to make a rug. I will be putting the step by step instructions up on my website soon. I haven't quite finished it yet as I need to tidy it up a bit. I will be using some hessian for the backing to protect it. I'm off to look at what everyone else is up to now. You can find lots of other great crafts at Handmade Monday on Wendy's fantastic blog. What a brilliant rug and I am so envious that you have a craft room! 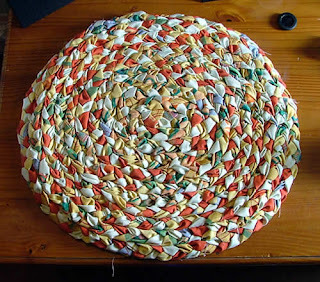 Rag Rugs can be so versatile, I love the colours of this one.... what colour are you doing the floor? Ooh, lovely rug! I remember making one about 3 decades ago but it never got properly finished. I can't remember what happened to it, but I love them! Lovely work & its great to see you along with all the rest of us who join in with Wendy's Handmade Monday. I am your newest follower - I look forward to reading more about your work! Thank you for all your lovely comments. The floor is going to be terracotta, similar to the red in the rug. I've been checking out everyone else's posts and the amount of talented people here is amazing. Having a craft room is great I'm just trying to organise all my stuff I have filled all the shelves already. I seem to have craft stuff everywhere. Equally jealous of the craft room! I have a table behind the sofa (and a big packet of baby wipes for paint spillages!). Love the rug - it's a new one on me - how is it made? Years ago I started one of these and never finished it. I don't have any idea what I did with it, I bet it got tossed out when we moved or something. I will look forward to your instructions, maybe I will try it again. Yours looks great! Nice rug, unusual, reminded me of when I was little. Mum used to make rugs from remnants, but with a hook. It's quite easy to make I will get the instructions with photo's up sometime this week. I find it easier to explain with photo's so that you can see what I mean if I don't explain it well. I'll post on my blog once I'm done. Thank you all for your comments they are appreciated. Love the red colour in the rug. It really brings the plaiting together. I have done coasters and table settings before using this technique but never attempted to do something larger. Might give it a go again. hugs Mrs A.